Our story begins with a mulberry trea and the discovery of silk by a Chinese princess. The Empress tried to pull the cocoon out of her tea, but found that only a thin strand slowly unwound itself from the cocoon. In amazement, she discovered the very fine and very strong fiber known as silk. The rest, as they say, is history. Many people enjoy the luxurious texture and elegant style of silk. Perhaps fewer know that the food silkworms munch on the create lustrous silk is the mulberry leaf. It should no surprise, then, that the raw material for silk is packed with many medicinal qualities for humans to enjoy. There is a long history of planting the mulberry tree in China, with over 3,000 years of records ot its cultivation. In an ancient book, “ The Book of Songs,”one finds descriptions of mulberry leaf and its uses. It is noted that mulberry leaf was used for raising silkworms, mulberry bark was used for papermaking, and the fruits were used for food. And of course, the leaf, the branch, the fruit and the root were mentioned for their medicinal qualities. The ancient Chinese observed that he mulberry is very tasty, with no side effects. Scholars in China substituted mulberry leaves for regular tea leaves in order to maintain youthful qualities. 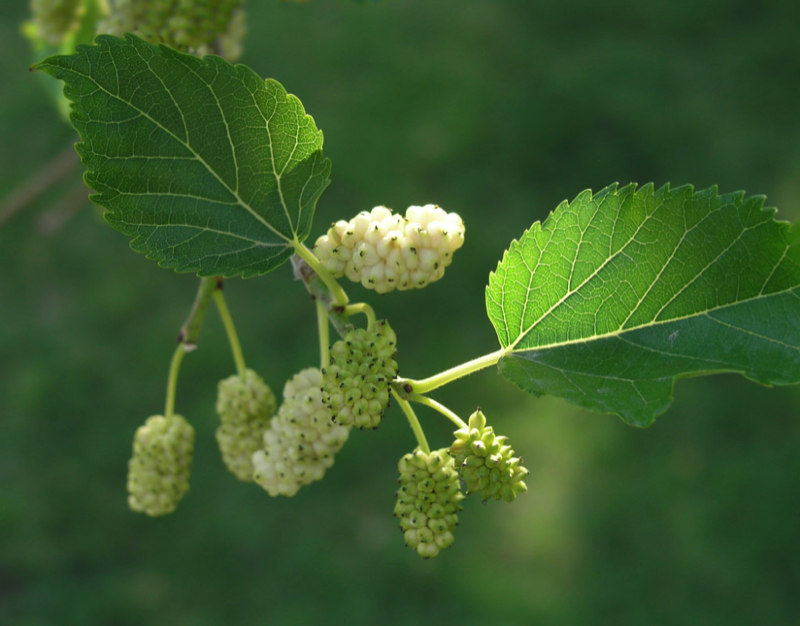 Mulberry leaf was also used in Traditional Chinese Medicine (TCM). It was used to expel wind and clearing heat, clearing the liver, and improving vision. Other uses in TCM include relieving cough and cold symptoms, curing dizziness, strengthening the eyes, promoting healthy blood, curing dysentery, treating stomachache, supporting liver function, and sustaining youthful skin. Meanwhile, in Japan, records showed that mulberry leaf was used to treat diabetes. The Central Institute of Silkworm Industry in Japan developed the mulberry tea for health care, due to its content rich in protein, minerals, and vitamins. When drunk, the Japanese noted that it is a very convenient way to quickly absorb nutritive elements, along with promoting metabolism and removing fatigue. In Japan today, there are still many products which incorporate mulberry leaf, including rice noodles, sweet cake buckwheat noodles.